The laptop computer image preoccupying Falk Amelung and Tim Dixon looks like '60s psychedelia. But the so-called interferogram, a composite radar snapshot of Haiti captured by Japanese satellite just before and after the Jan. 12 earthquake, is a trove of geological information. And much of it has taken the University of Miami geologists by surprise. The kaleidoscopic color contours rippling from the quake's epicenter, west of the capital, Port-au-Prince, indicate not just lateral but also unexpected vertical movement along the fault line. What's more, the quake's rupture didn't reach the surface, unusual given its powerful 7.0 magnitude. But there's a more important anomaly: despite the quake's force, the fault-line segment that ruptured is only half as long as Amelung and Dixon anticipated. That has left the other half, which lies only a few miles south of Port-au-Prince, subject to that much more stress, which may cause another quake to come sooner than later. "Even if the next earthquake is the same magnitude," says Amelung, "it will still be more damaging to Port-au-Prince" than last month's was. As a result, geologists like Amelung and Dixon are now urging the Haitian government and its international donors to consider relocating the capital, which was largely reduced to rubble in the quake. The new site, they say, should be well away from a fault line they believe is poised to crash again within the next generation or two, but even closer to Port-au-Prince. "If this [had been] a typical earthquake, the risk of future incidents would decline over the next few months," says Dixon. "The stress would be relieved and we could all go back to sleep for another 250 years," which is about how long ago Haiti's Enriquillo Fault last convulsed. "But that's not the case here  our findings suggest another shoe has to drop." Amelung and Dixon, working with two other geologists from Miami's Rosenstiel School of Marine & Atmospheric Science, Sang Hoon Hong and Shimon Wdowinski, were taken aback when they realized that only the western half of the Enriquillo Fault segment that ruptured in 1751 fractured this time. (That half, about 25 miles in length, lies right under the city of Leogane, the Jan. 12 epicenter, which is about 20 miles west of Port-au-Prince.) The eastern half of the segment, far closer to Port-au-Prince, is the other shoe Dixon refers to  and if and when it drops, it stands to hit the capital that much harder. That's made it all the more urgent for the geologists to solve why last month's earthquake behaved the way it did. Amelung, for example, wants to explore whether the atypical vertical motion detected in the quake may have affected the rupture's short length and potent magnitude. 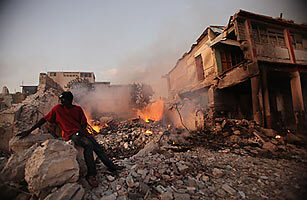 But whatever the causes, the scientists say Haiti can avoid the devastation of a seismic sequel. Says Dixon, "We feel we have enough knowledge gathered now to recommend that [Haiti's capital] should rebuild critical infrastructure farther to the north, out of harm's way," and where the ground often has more stable rock instead of the more alluvial soil around Port-au-Prince. In this case, the earth scientists' case for moving the capital may actually dovetail with the arguments of social scientists. Haiti is the western hemisphere's poorest country, which is a primary reason Port-au-Prince, with some 2 million residents, is one of the world's most densely populated cities. This combination of factors helps explain why as many as 150,000 people were killed in last month's quake. Many development experts believe that the city's population needs to be halved, and the rebuilding process may offer an opportunity to resettle some half a million people outside the metropolis to new or existing communities that offer jobs and infrastructure. Moving an entire capital, of course, is another matter, even if the collapse of the National Palace and other key government structures makes it more possible to contemplate. It's hardly unprecedented and could even serve as a driver of development. The earthquake "creates opportunities for development elsewhere in the country," says Jocelyn McCalla, a development adviser to the Haitian government. "Haiti has to be engaged now in a major decentralizing effort." Brazil did just that in the 1950s, when it moved its capital, with all the associated buildings and bureaucracy, from Rio de Janeiro to Brasília, some 600 miles away on the country's relatively unpopulated central plateau. Most Brazilians today agree that the move helped spread political and economic power. Amelung and Dixon say it behooves Haiti to at least consider relocation scenarios, perhaps moving government, medical and education infrastructure as far north as the port city of St. Marc. Although scientists traditionally take several months to publish such findings in a peer-reviewed journal, the geologists say the urgency of the policy choices facing Haiti right now demanded that they get the word out quickly. Data from the Japanese satellite's synthetic aperture radar imaging are reaching the broader scientific community in a timelier manner, thanks to new digital supersites developed last year by Amelung and other members of the international Group of Earth Observations (GEO), including JAXA, the Japanese space agency. GEO is working to break through the bureaucratic logjams in which such data often become mired. The Haiti information, which is also being studied by NASA's Jet Propulsion Lab as well as the U.S. Geological Survey, indicates that "this [tectonic] plate boundary is way more complicated than we previously thought," says Amelung. The Caribbean isn't generally known for seismic catastrophe. But scientists, including Dixon, began seriously scrutinizing the Enriquillo Fault in the 1980s, eventually determining that it was a major quake hazard. Known formally as the Enriquillo-Plantain Garden Fault, it forms a boundary between the North American and Caribbean plates  and a sort of volatile spine running along the southwest peninsula of Hispaniola, the island Haiti shares with the Dominican Republic. Port-au-Prince has experienced at least two large aftershocks since Jan. 12. Geologists like Eric Calais of Purdue University are trying to ascertain whether they are a sign of the fault settling or a setup for a bigger earthquake in the near future. Calais told the National Science Foundation last week that he and his team are also "concerned for the Dominican Republic, as our preliminary models show that the continuation of the fault in this area is loaded." Whether or not Haiti and its international donors agree to move the capital, the geological findings mean they'll have to give serious attention to proposals on population relocation and to tightening Haiti's abysmally shoddy construction codes, which allowed the quake to wreak greater havoc than it should have. That disaster may have caught authorities unprepared, but they no longer have that excuse. See video of TIME staffers finding a 94-year-old earthquake survivor in Haiti. See the top 10 deadliest earthquakes. Next Who's to Blame for Suspending Haitian Medevac Flights?